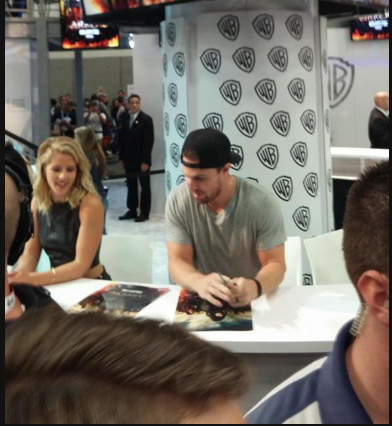 Stephen Amell and Emily Bett Rickards signing autographs at SDCC 2015.. . Wallpaper and background images in the Stephen Amell & Emily Bett Rickards club tagged: smile19 stemily stephen amell emily bett rickards san diego comic con 2015. 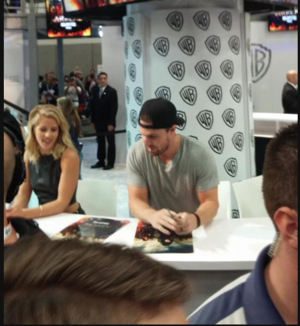 This Stephen Amell & Emily Bett Rickards photo contains teken, poster, tekst, bord, and schoolbord. There might also be brasserie, eettafel, lees kamer, and leeszaal.